1. Our projects should be a reflection of what we learn in class. Pinhole project aligned somewhat with class. I’ve run a musical instruments project as well as a pinhole camera project this semester. For the musical instruments, kids struggled to see how placing frets on a stringed instrument was an application of our string resonance relationship. Next year, I want to have a lab where we build a monochord (single string instrument) complete with a full octave of frets. This’d hand off to the full project very smoothly. For pinhole cameras, I will modify to ask for them to calculate the magnification based on object distance and image distance. Then I’ll ask them to predict image height based on magnification. Do you do projects? How do you keep them closely aligned to the rest of class? 2. Labs are fun to do but my current format is a PITA to grade. Lab writeups take me over a week to grade. I don’t see that changing. A week is too long for a student to actually use the feedback. How can I create a self-checking lab? Ideally, once a paper is handed in, it’d already be corrected. I’ve done a little of this — some labs have a section I have to sign off on before the kids move on. When grading, I just look for my initials. Maybe my grading solution is as simple as building similar checkpoints throughout all my labs. One question of many on a recent lab. 3. How might I better develop units-sense in my freshmen? What I mean is “how can I get the kids to see that units matter?” If you say you need a pinhole diameter of 0.6, I have no idea how big that is because you didn’t tell me inches or millimeters (it was millimeters). My kids view units in physics like they view showing their work in math — busy work the teacher makes you do that’s just picky details, not actually useful. I can absolutely see incorporating units into projects in a way that makes them useful. Sometimes I have to control the power tools and the kids have to specify the size of a cut. If a kid doesn’t supply units, I can purposely choose the wrong units. A board that should be 2 inches wide could be made 2 meters wide, for instance. How do you drive home the value of units? 1. align projects: Can this be helped if the project “is” the class? Take the pinhole camera. What would happen if you never had class time spent on the vocab, calculations, history, whatever, but rather just told them to go “do it?” This’ll slow things down, sure, but then they’ll own all the material they learn about, and the question of connection to class disappears. I’m certain I’m drastically simplifying that example, forgetting about all kinds of logistics, but I’d love to know whether moving in that direction might be useful. 2. Lab: Do more of what I call “target” labs? You did the block of glass/laser reflection/refraction lab (at least I think that was you). My HS phys teacher did something similar and, as I recall, he graded it simply by turning on the laser and seeing if I was right. Again, more logistics problems, I’m sure. But this time, also a incredible coarseness of feedback, which might not work for their learning. 3. Units: As I read what you wrote, I was thinking that the students clearly have the units in mind when they ask for a board cut of “2”, they’re just not articulating them. That’s a problem I can live with, with the occasional joke like you suggest (cutting the board 2 meters). The other problem is homework where they just drop the units. I’ve had some success asking my students to talk about the reasonable-ness of answers, which they can usually only do when there’s units attached. 4. neglect: We were talking in the global physics dept the other day about how it felt like there was less physics blogging these days. We recognized that there’s a bunch of people doing 180’s, but we felt they weren’t always as in-depth. Unfortunately, a ton of the people doing 180s are people like you who “used to” (I put that in quotes to show I don’t really mean it that starkly) blog regularly. What are your thoughts on that? Do you feel that you’re getting the community feedback you need to keep you blogging with your 180’s? Thanks for your thoughtful reply, Andy! Definitely. I’ve dabbled in this area before but always dead-end on the details. Let’s run with the pinhole camera project, to explain myself. Suppose my entire light & optics unit centered on the camera. Currently, we learn about Snell’s Law, ray tracing, concave and convex mirrors, and stuff I’m certainly forgetting this late on a Friday night. Most of that stuff becomes interesting background that ultimately doesn’t matter in creating a camera that works. 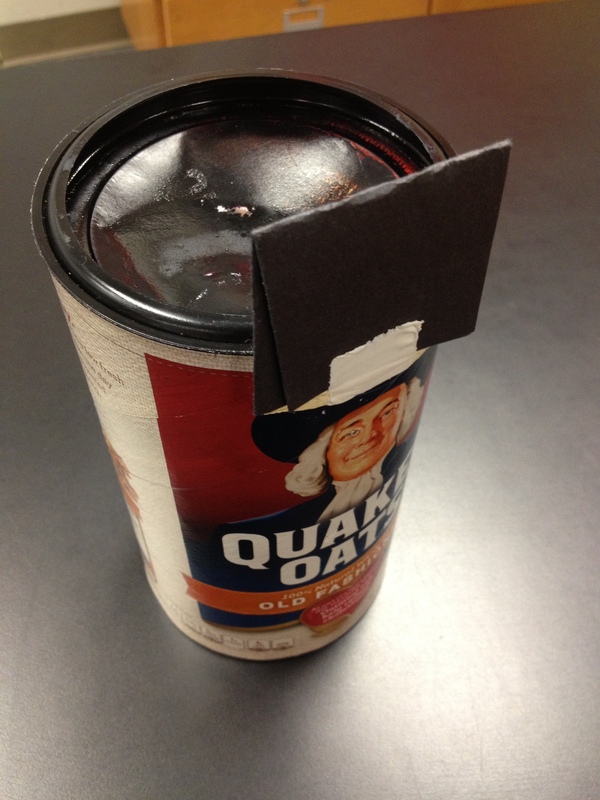 Maybe pinhole cameras aren’t the right project for this unit of study. I need some time to think about this. 2. Lab: Do more of what I call “target” labs? You did the block of glass/laser reflection/refraction lab (at least I think that was you). My HS phys teacher did something similar and, as I recall, he graded it simply by turning on the laser and seeing if I was right. Yes! My flat mirror lab is a target lab. The kids have to hit a bullseye to earn top score. I also ask them to label the diagram as well with normal lines, incident, and refracted angles. The refraction lab could be a target lab too. Wow, you’re right, I need to expand my repertoire of target labs. 3. Units: As I read what you wrote, I was thinking that the students clearly have the units in mind when they ask for a board cut of “2″, they’re just not articulating them. That’s a problem I can live with, with the occasional joke like you suggest (cutting the board 2 meters). 4. neglect: We were talking in the global physics dept the other day about how it felt like there was less physics blogging these days. We recognized that there’s a bunch of people doing 180′s, but we felt they weren’t always as in-depth. Unfortunately, a ton of the people doing 180s are people like you who “used to” (I put that in quotes to show I don’t really mean it that starkly) blog regularly. What are your thoughts on that? Do you feel that you’re getting the community feedback you need to keep you blogging with your 180′s? The 180 blog definitely comes with less feedback than this blog. Also, I think it fragments my readership. Next year, I’m considering an Instagram feed to replace the 180. Any exposition I want to make on the pictures will go here on this blog. As a consumer, I enjoy reading the 180 blogs because they offer me quick ideas I might try. Little things that I think a lot of us might pass off as “everyone already knows about this boring old staple of a lab”. Stuff that as a relatively new teacher (or just as one who doesn’t use modeling), I might not have known about. I don’t need to read much on those, just see how you set something up. As an author, the best part of the 180 blog is that I’m being more reflective. My blogging in the past has been more about sharing polished ideas/lessons and less about reflecting. I’ve even lesson planned this year with the 180 blog post in mind. Knowing that I’ll have an audience makes me do better. The worst part of the 180 blog is that I’m not blogging here as much. As you point out, the depth is missing. I don’t know that *I* was a deep blogger, but I definitely miss it in others who are keeping 180 blogs.